Recently in my travels round Brixton, I keep coming across Americans who now live here. It’s testament to what a great area Brixton is that many of them say it’s the best neighbourhood they’ve ever lived in and my recipe here is partly inspired by them. But its mainly inspired by my determination not to shudder slightly whenever I see piles of okra on the stalls in the market. I’ve only ever eaten it once when I was a child and was singularly unimpressed by its slimy texture and have avoided it ever since. But encouraged by African friends who consider it a kitchen staple and those Americans who all responded affirmatively when I mentioned it, I’ve decided to give you my melting pot take on it and like the good Belfast girl I am, fry it. I mean, what food doesn’t taste even better when fried? Get your oil on to heat, making sure you only fill your pan a third full of oil so it can’t bubble over. You want it hot but not scorching. 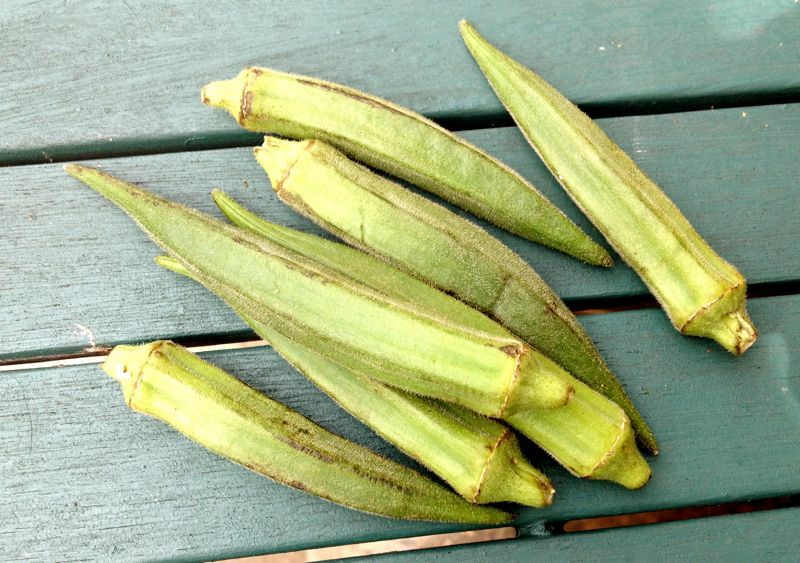 When buying the okra, make sure the pods are nice and furry and not split at all. Wash them and dry them well. Cut each pod in roughly three pieces. Then dip the pieces into the beaten egg before putting them into the cornmeal and making sure they are well coated. Don’t hang about, do both dippings quickly and put them into the oil immediately to cook. Give them about 2-3 minutes each side or until the okra and the coating both go golden. *An edited version of this post originally appeared at Brixton Blog. For those of who wondering what kind of shenanigans that is, let me elaborate. Poutine is the unofficial dish of Canada, a religion in Québec, especially Montréal and known elsewhere as chips covered with gravy and cheese curds. It’s not pretty dish, but it’s a glorious mix of carbs, grease and fat best served piping hot and after alcohol has been consumed. A grown up gravy chip. I’ve never seen it served here and it might seem like a right faff to go to, but luck and a certain amount of planning made it fairly straightfoward. The seemingly tricky bit is the cheese curds. I already had the rennet from previous cheesemaking exploits and have discovered that even the little Sainsburys in Brixton sells unhomogenised Jersey milk. So fresh they squeak cheese curds were only a few minutes away. While the spuds for my chips parboiled, I scalded the milk, added the rennet and let the curds and whey develop. Dry the curds off in a cheesecloth or muslin and turn your attention to the chips. Having drained the chips, I couldn’t be bothered with all the stages Felicity Cloake suggests here and fried them for five minutes at lowish temperature, before draining on kitchen paper and allowing the oil to get really going. I’d roasted a chicken earlier in the week and by some feat of willpower had the juices left to make gravy with. I thickened it up with cornflour and heated it up. I broke the curds up a bit more with a fork and let drain well before batch frying the chips til very golden. I personally loathe an anaemic chip so relished the opportunity to get these good and Ronseal brown in the hot fat. At this point I cannot claim how authentic my poutine was. I dusted the chips with salt and pepper, poured the gravy over and then added the curds. I should have done the curds first and then the gravy to make sure the cheese melted more, but I was too hungry to be too bothered. I got stuck in. And zut alors, I can see why the Quebecois love this dish so much. It’s simple, it’s tasty, it’s filling. It’s soft and crunchy at the same time and cries out to be eaten quickly and while piping hot. The cheese curds melt more like mozzarella than cottage cheese and add a creaminess. The squeak is a little bit like halloumi and the whole thing works like a charm. I loved it. I like a bit of fine dining as much as anyone, but sometimes one’s tastes run a bit more on the casual side of things. I don’t mean I ever want to eat a Prawn Ring or kebab meat again and I believe ready meals to be a waste of calories. But I do have a soft spot for the kind of comfort food that borders on junk, especially that brand of Americana popularised by Nigella recently. So when Mister North was down recently, it seemed like the perfect opportunity to indulge some homemade delights that would make a dietician weep. I’d been lusting after deep fried pickles ever since a Southern friend told me about them a few years back. Seeing Homesick Texan and Food Stories‘ recipes for them put them at the top of my to try list. I dialled down the trashy vibe and put myself in the running for a pretentiousness award by growing my own gherkins and pickling them myself specially. (If this makes you eye roll at the sheer foodiness of it all, be comforted by the fact they didn’t taste that different to a Mrs Elswood.) Horticulturally experiments aside, these babies are super simple. I got cultured buttermilk in Sainsbury’s, but you could use yoghurt watered down instead. Do not feel tempted to substitute cream crackers for saltines. You’ll end up crying into your hot oil as all the moisture in your mouth evaporates. I used coarse cornmeal instead. Heat your oil while you do the flour, egg, dip thing with the pickles. Fry for about a minute each side and then serve piping hot on the side of something delicious. In our case it was some leftover rollmops, a zingy homemade ranch style dressing with buttermilk, tarragon and garlic and a beer on the side. It was a heavenly plate of tanginess, crunch and sheer gluttony. I want to eat all gherkins in a crunchy coating now. Using some non-homogenised cow’s milk from Alham Wood Farms at Brixton Farmers’ Market, my fledgling cheese making skills, some citric acid that we explored all of Brixton for* and my trusty bottle of rennet, we created mozzarella magic. Surprisingly easy, especially if you have asbestos hands like Mister North for dipping the curds into the hot whey, we ended up with two beautiful bouncing balls of mozzarella in no time at all. Buoyed by this, we turned to the pizza bases, lovingly dressing them with homemade sauce courtesy of Mister North and a glut of Blackpool tomatoes and an umami hit of anchovies, green olives, some of my home grown plum tomatoes and a finishing sprinkle of ham salt from Comfort and Spice. Unfortunately made giddy by the cheese achievement, we forgot to dust the worksurfaces with semolina as instructed and the bases stuck somewhat, leading to some creativity with a fishslice and a slightly concertina style pizza. The pizza might have lacked finesse, but it was loaded with flavour. The tomatoes tasted of summer and the mozzarella was so soft and fresh I could have eaten the whole ball like an apple to fully enjoy the texture. It needed a touch more salt and I think it would have been even better with buffalo milk, but for a first go, it was pretty amazing. We devoured the pizzas like kids at a sleepover, both wishing we’d had more of the mozzarella to do a tomato salad with or go retro and deep fry in a crispy coating like the gherkins. Instead we rounded off a day of gluttony with a cheeky bowl of Veda bread ice cream and a glass of wine or two, proving that sometimes the taste of home is all you need. Your own kitchen provides the greatest comfort. *Try the Nour Cash and Carry if you need it Monday to Saturday and the Low Price Food & Wine on the corner of Brixton Road and Loughborough Road on a Sunday. We did the walking round so you don’t have to.